I thought I'd show the back of an orchid piece, with the hanging mechanics that seem to be working for me. Here's the top of the back with a few notations. The hanging "sleeve" is essentially an upside-down pocket handsewn onto the back facing. A piece of foam core (cut to size and edges taped) is slid up into the sleeve. 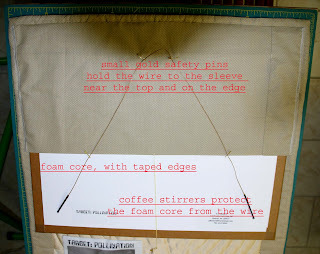 The hanging wire passes through 2 holes in the lower corners of the foam core, about 2" up & 2" over from the corners. I used coffee stirrers to reinforce the holes. The wire runs through these and is twisted together and taped down on the backside of the foam core. Small gold safety pins hold the wire to the sleeve so the piece doesn't flop forward when it's hung. 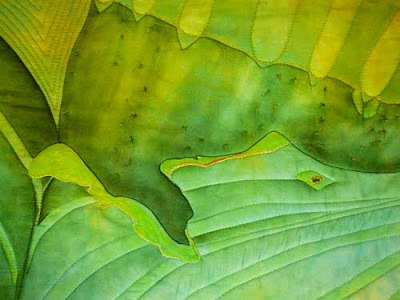 Wow, it has taken a while but I have finally finished the fourth quilt for our upcoming exhibition Orchids: Sensuality Stitched. Fiber Art Options met last week and we got to see several of the pieces that were ready for the show. I am really delighted to be in this great group. Lots of variety, lots of different styles and the quality is high throughout. A real honor to be among such great artists. We deliver the work this coming Thursday. Hope the roads have cleared of ice and snow by then. Opening of the show this coming Saturday and Sunday will feature many of us doing talks, walk throughs and demonstrations from 12 to 4 both days.